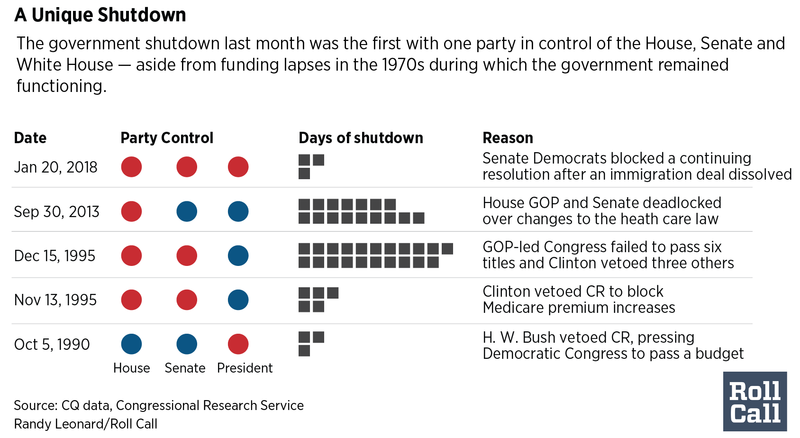 “Just signed bill,” Trump tweeted around 8:45 a.m.
Trump used the bipartisan spending deal, and concessions he and GOP members made, to lobby for more Republican members of Congress. “Costs on non-military lines will never come down if we do not elect more Republicans in the 2018 Election, and beyond,” he wrote on Twitter. He lauded the bill’s exclusion of language addressing the Deferred Action for Childhood Arrivals, or DACA, immigration program, saying “negotiations to start now!” But talks have been underway for months among Republicans, Democrats and his own aides. The package Trump signed Friday morning reopens the government through March 23, raises the debt limit, provides an additional $300 billion for defense and domestic programs over two years and allocates relief dollars for hurricane and wildfire victims. Now flush with cash, the federal government can resume normal operations after the second shutdown of the Trump presidency. The budget deal features what White House aides in recent days have called “priorities” for Trump: a two-year increase in spending caps, more money for the Pentagon, and an extension of the borrowing limit hike into next year. “Our Military will now be stronger than ever before,” Trump wrote in the tweet. In a second tweet posted soon after, Trump said the GOP was forced to hike spending for “things we do not like” — meaning for many domestic programs prized by Democratic members — in order to boost military spending. He also reiterated his call for voters to elect more Republicans to avoid that down the road. The president mostly kept his hands clean in the weeks-long talks to fashion the bipartisan budget deal. In recent days, White House aides did not describe Trump as heavily involved in getting the massive package through both chambers. Nor did they describe him as working the phones. Unlike in the past, members of Congress were not brought to the White House for some presidential arm-twisting or eleventh-hour negotiations. Instead, Trump and his senior staff spent much of their time in the run-up to the brief shutdown dealing with the fallout from a domestic abuse scandal involving former Staff Secretary Rob Porter. Trump himself has been silent on the matter, but Principal Deputy Press Secretary Raj Shah on Thursday admitted White House officials could have handled it better. Seventy-three House Democrats helped push the spending package over the finish line around 5:30 a.m. Friday, even after House Speaker Paul D. Ryan, refused to give them a guarantee he would hold a floor vote on the DACA immigration program. Minority Leader Nancy Pelosi and others had pushed for Ryan to bring bipartisan and conservative immigration bills to the floor under a rule known as “queen of the hill.” That process would allow the bill receiving the most votes above a simple-majority threshold to prevail. The most Ryan would give them was an assurance that he would bring immigration legislation to the floor that Trump would sign into law. Trump signed an executive order in September terminating the Obama-era DACA program, which currently protects around 690,000 people from deportation. The program will end on March 5 unless Congress sends him a bill that retains it in some form. Niels Lesniewski and Lindsey McPherson contributed to this report.